Malaysia’s hill stations provide relief from the heat and a glimpse into the country’s colonial past. Our bus sped along the steeply ascending road, careening around hairpin turns. Outside, dusk began to fall, and the rolling green hills of Malaysia’s Cameron Highlands were shrouded in mist. Tired and a little carsick, we stepped out of the air-conditioned bus in the town of Tanah Rata and were met with a surprise: it was cold. In the late 19th and early 20th century, Malaysia’s colonizers built a series of hill stations: towns at high elevations that provided a refuge from the heat. 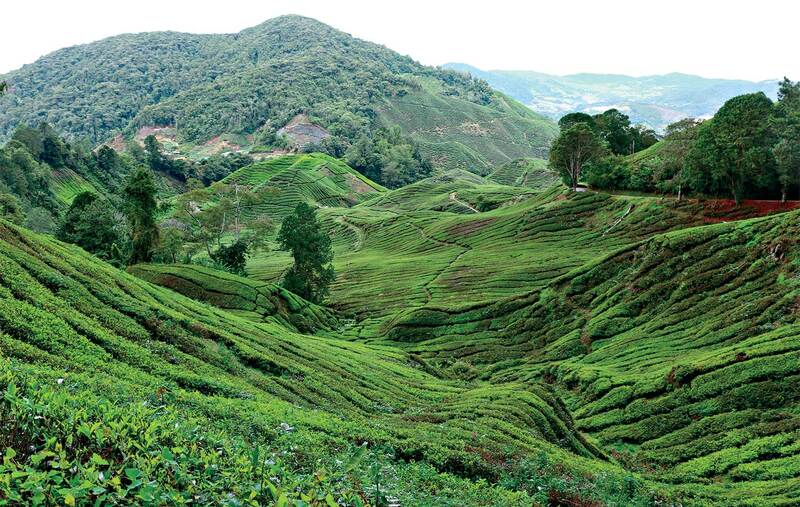 With an area the size of Singapore, the Cameron Highlands is one of the largest hill stations in Malaysia. When a 1925 survey revealed that tea plants could be successfully grown there, the area was developed for agriculture and as a sanatorium for homesick Britons. Today, it’s one of the largest tourist draws in Malaysia. Malaysian Digest estimates that there are around 30,000 visitors a week, and accommodations range from backpacker lodges to luxury hotels. More than 50 years after Malaysia gained independence from Britain, its colonial history is still evident in the numerous Tudor-style buildings and the popularity of afternoon tea. The region’s natural beauty, however, is all its own. Hiking is a popular activity in the Cameron Highlands; a network of trails leads out of town, through farms and jungles, to a variety of destinations. On an overcast afternoon, we hiked for around 2.5 hours through the refreshingly cool (and at times very muddy) jungle to reach the peak of Mount Batu Brinchang. On the trail, the thick moss, echoing calls of unseen animals, and misty views made for a memorable walk. The peak is also accessible by car, and we followed the winding road back into town, past tea plantations and produce farms. Agriculture is still a major industry in the highlands, and many tea plantations have guided tours, cafés, and gift shops. We stopped at the Boh Sungai Palas Tea Centre on our walk down, and enjoyed tea and scones with fresh strawberry jam. Sitting on their windy patio, surrounded by verdant hills of carefully manicured tea plants, was a lovely way to spend an afternoon. In addition to tea plantations, many other farms are open to visitors. The cool climate is ideal for producing flowers, vegetables, and fruits that can’t be grown elsewhere in the country; strawberries are especially common. Unfortunately, the agriculture that has made the Cameron Highlands such a success is also contributing to its downfall. In November 2014, the New Straits Times reported that illegal land clearing is being blamed for a fatal landslide. The landslide caused a decline in tourism and prompted stricter enforcement of land use laws. Pesticide use is also problematic. In March 2015, the Malay Mail reported that a number of banned agricultural pesticides were discovered in the rivers and water catchment, raising health concerns. Despite the current environmental challenges, the area retains its charm. Hopefully, the Malaysian government’s attempts to resolve these issues will result in a healthier region that can continue to serve its growing agricultural and tourist demands. As our bus began the three-hour descent to humid, bustling Kuala Lumpur, we were cool and refreshed, but a little sad to leave. The Pacific Rim is home to many beautiful countries. Here are some suggestions of where to go and when.